My day was made when I was informed that I had been awarded the Edgar Palamountain Award for Excellence, what an honour to be judged ‘first among equals’. 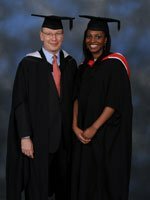 My time at Buckingham thoroughly exceeded my expectations; it was refreshing to have lecturers and staff in the Business School who were genuinely committed to my success and future. Unlike other universities you are not just a number, you are a name and a person. 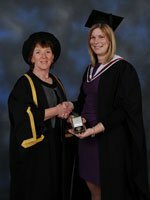 I feel that the two year degree has given me the tools and confidence to succeed in business, not just in terms of time management but also being taught the skills to work with people from all different backgrounds. One of the best things about Buckingham, in my opinion, is the fact that you have the opportunity to mix and work with people from all over the world and I have made some strong friendships – which does have the bonus of offering some lovely travel opportunities!! 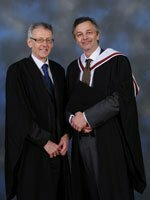 I would just like to thank all the staff in the Business School for their support and excellent tuition over the two years, I couldn’t have done it without them! When I found out that I had been selected to receive the Dame Barbara Shenfield Award I felt both humbled and honoured. Hearing the news from Buckingham was a most pleasant surprise and I am truly grateful to my LLM tutors for providing me with the tools that I needed to do well on the course. It’s a great privilege to receive the award and my family and I are extremely excited about the ceremony and the presentation. I thoroughly enjoyed my year at Buckingham. The course was both challenging and exciting and I met some wonderful people along the way. I would highly recommend the University to anyone thinking of doing a Masters in international, commercial or oil and gas law. The atmosphere is extremely friendly and the staff and tutors are always willing to help. All in all I had a memorable time at Buckingham and my experience at the university is one that I will always cherish.